I’m offering 2 new classes this spring. On the 5th of March I will be giving a 1 day class at the Burren College of Art, Ballyvaughan. We will be cooking and eating an entire vegetarian meal including appetizers, soups, main courses, 2 side dishes, and desserts. This will be a full hands on day where you will not only master all the recipes we will prepare but will get loads of nutritional info and cooking tips, as well. Sample menu includes; fresh salad greens topped with glazed walnuts, curried tofu crisps with a sesame ginger dressing, Thai pumpkin soup, seeded whole grain dinner rolls, stuffed courgettes and vegan chocolate cake, to mention a few! All supplies and handouts of recipes are provided. The hours are 10 to 4 and the fee is 70 euro. contact me directly at sheehanmt3@yahoo.com . For Men Only! I was asked to give a cooking class for men who want to learn how to cook or to improve on their basic skills. So, if you’re a man who is tired of the same old spud and overcooked cabbage, or you want to learn how to cook for yourself or your family sign up for this class which promises to be fun, informative and as all my classes are – hands on. You will learn new, easy recipes that are delicious and nutritious. you will be putting on the apron (no feminine colors or frills!) and cooking in a small class (6 men only) for 2 hours, after which we will eat what we cooked. 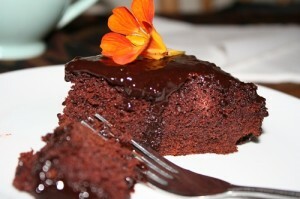 We will be cooking soups, stews, hearty breads, meat dishes, vegetables and vegetarian casseroles and desserts. The course runs for 4 weeks starting 15th march at The Boghill Centre, Kilfenora, from 8 to 10 pm. The cost is 125 euro including, recipes and all supplies, including a copy of my cookbook Coming Home To Cook. sign up at sheehanmt3@yahoo.com. The next time you need a lovely tea bread why not bake one that is delicious and good for you! Substituting unsweetened applesauce for refined sugar makes this bread suitable for diabetics, vegans and those with gluten free diets. The natural sweetness of the apples is all you need. And, the kids will love it! Blueberries are a great source of Vitamins A,E and C, fiber, beta carotene, anti-oxidants and magnesium. I added a Tbl. of ground flax seed which are packed with Omega 3’s, one of the richest sources of essential fatty acids. A sprinkle of sesame seeds added to the crumb topping adds iron, calcium, and B vitamins, important for vegetarian diets. And, it’s gluten and dairy free and has no eggs, which makes it ok for vegans. Enjoy with a nice cup of tea. 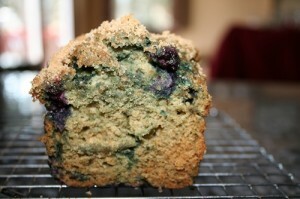 1 1/2 cups fresh blueberries, 1 1/2 cups unsweetened applesauce, 1/4 cup canola oil, 3 cups gluten free bread flour, such as brown rice flour or a gf bread flour mix. 2 tsp. baking soda, 1 tsp. baking powder, 2 tsp. grated nutmeg, 1/2 tsp. allspice, 1/2 tsp. cinnamon.1 tsp. vanilla, optional: sprinkling of brown sugar. Mix together flour, flax, baking soda and baking powder. In a small bowl combine applesauce, oil, vanilla and spices. Add 1/2 of the blueberries into the wet mixture and combine with dry ingredients. Fold in the rest of the blueberries. Pour batter into 2 greased bread pans and sprinkle with sesame seeds and brown sugar, if desired. Bake at 350 for 35-45 minutes.